Business succession planning is not just limited to small or large companies individually. In fact, businesses of all sizes can greatly benefit from having experienced and capable employees ready and willing to take on new leadership roles as they become available. Succession plans are essentially a proactive measure taken by business owners or managers to help ensure the future needs of a company are met should a key employee retire, resign, get fired, become ill, or pass away. Learn more about the many benefits of succession planning for small and large companies. Without a solid succession plan in place, your business may cease to exist once you are no longer able to run it yourself. When you choose a successor, you can ensure that your business continues operating long after you are gone. Business succession planning is especially important for small businesses as there are generally fewer people involved in the business; that means that there are fewer individuals available to take over vital job roles. Large companies can also achieve security through succession planning. In large businesses, there is a lot at stake and a sudden loss without succession can result in total chaos. Estate planning is an effective way to prepare for end-of-life issues. How your business is handled after you die is an important component of estate planning. Business succession planning helps eliminate confusion as to who will carry on your legacy after you are no longer able to make decisions. 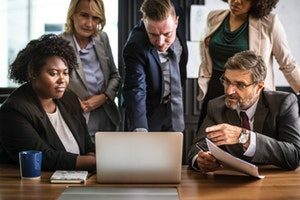 For small businesses where family members may make up the bulk of employees, succession planning can make the estate distribution process run more smoothly and help eliminate disputes between family members. In larger businesses, succession planning can result in an effortless transition between owner and successor without confusion. It is never a good idea to choose your successor on a whim. Through the business succession planning process, your company is able to identify what positions are most critical to the company’s future success and pinpoint possible candidates who have the skills, values, and desire to take on these roles. When succession planning for a small business, you may want to consider which family members have the time and capability to run a business. Larger businesses may need to take a more in-depth approach to ensure that the successor chosen has the necessary industry expertise. Once a successor has been identified, businesses are able to start any necessary training to help ensure that the person is ready to take on the specified role. The business succession planning process is designed to help business owners identify possible competency gaps and use this information to groom the successor for their future leadership position. For smaller businesses, training might mean on-the-job training or job shadowing for a period of time. Larger businesses may have the funding and resources needed to encourage more in-depth training in the form of professional job coaching, mentoring, or a gradual increase in advanced responsibilities. You should always cast a wide net as you search for a successor. Making jobs available publicly is not necessarily a legal requirement for most employers, but external job postings can help you to avoid the appearance of favoritism or unintended discrimination. That being said, the process of hiring externally can be both time-consuming and costly when you consider advertising, training, and evaluation expenses. Succession planning for small businesses can reduce expenses by allowing an established employee to learn a new skillset and grow into the leadership role. When it comes to larger businesses, succession planning boosts employee retention and allows current employees the opportunity to rise on the career ladder. Your company’s brand and reputation play a vital role in how it performs over time. One of the biggest mistakes you can make is choosing to hire a new individual who is not familiar with your company to step in as your successor. The person may not fully recognize your company’s fundamental mission and values which could potentially taint your company’s brand in the eyes of clients or customers. Preserving brand awareness is important for both small and large companies who want to continue building their business. No matter how long you have been in business, or whether your company is small or large, going through the business succession planning process can be highly advantageous. Many business owners do not have a solid succession plan in place, and when they pass away, their company often dies with them. In the same way that you would plan for your retirement, it is crucial to implement safeguards for your business. For more information about the benefits of succession planning or to receive assistance in creating a business succession plan, contact the business law attorneys at Odin, Feldman & Pittleman.